In America, German Sauerkraut is often thought of as a condiment on top of hot dogs or bratwurst. In Germany however, in the Alsace Region of France, and in several Eastern European countries, the Sauerkraut is more than a condiment or side dish, it is the main dish! The first step into taking the German Sauerkraut Recipe seriously is the use of its secret ingredient, the juniper berries. Get ready to prepare this easy and amazing recipe! Place the Sauerkraut in a bowl. Add cold water and drain. Cut the salt pork in small pieces and roast them in a roasting pot until the fat has melted. If you use the lard, melt it until it becomes liquid. Dice or chop the onion and roast it in the melted salt pork or lard until they are transparent. Add the drained sauerkraut and the wine to the onions and mix well. Add just enough water to cover the sauerkraut. Peel the apple(s), cut in quarters and take the core out. Cut the quarters three times lengthwise and then into slices. Add the apples, bay leaves, juniper berries and cloves to the Sauerkraut, mix well and bring to a boil. Turn the heat down to medium medium-low and let the Sauerkraut simmer for about 45 minutes. If the water level goes down, do not refill. 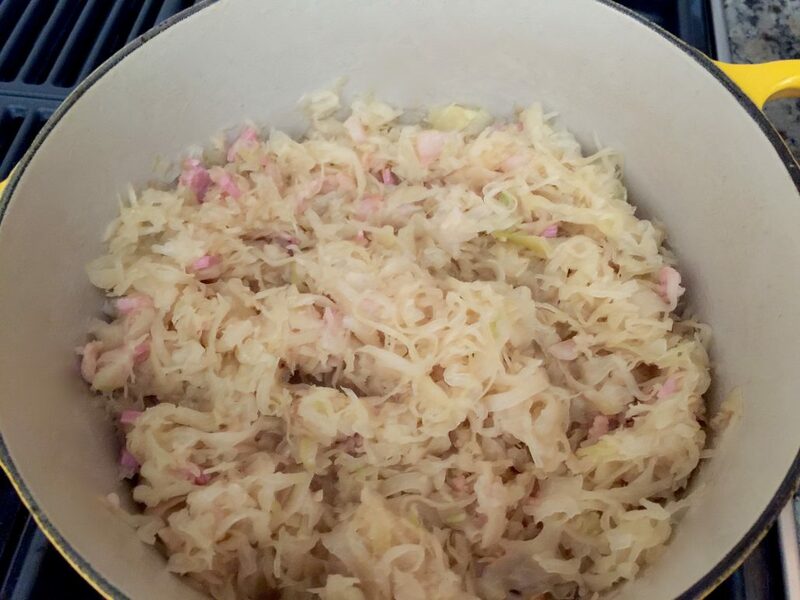 Instead, stir the Sauerkraut every once in a while so that the Sauerkraut won’t burn. When finished cooking, take it off the stove and remove cloves, bay leaves, and juniper berries using a fork. If you are using the German “Henstenberg” Sauerkraut, you do not need to wash it. 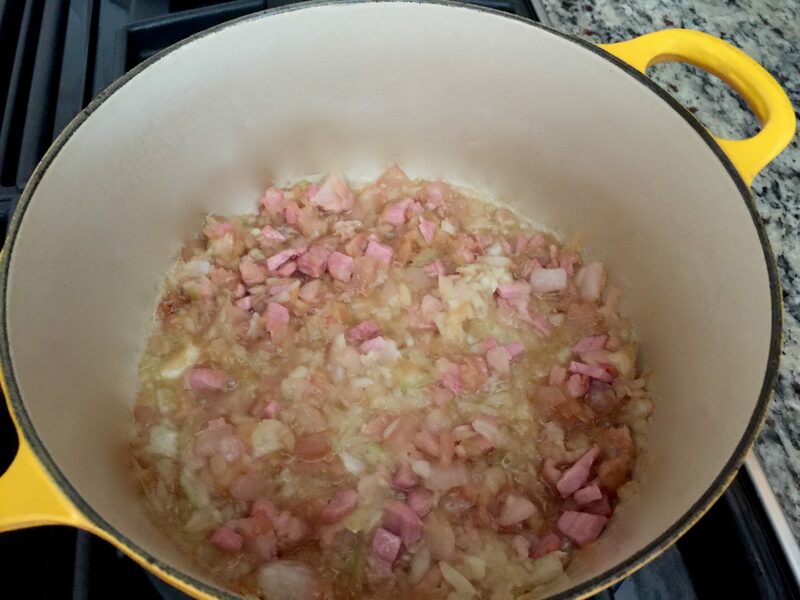 Once you have roasted the onions in the melted pork fat or lard, as described above, place the content of the can with German Sauerkraut into the roasting pan. 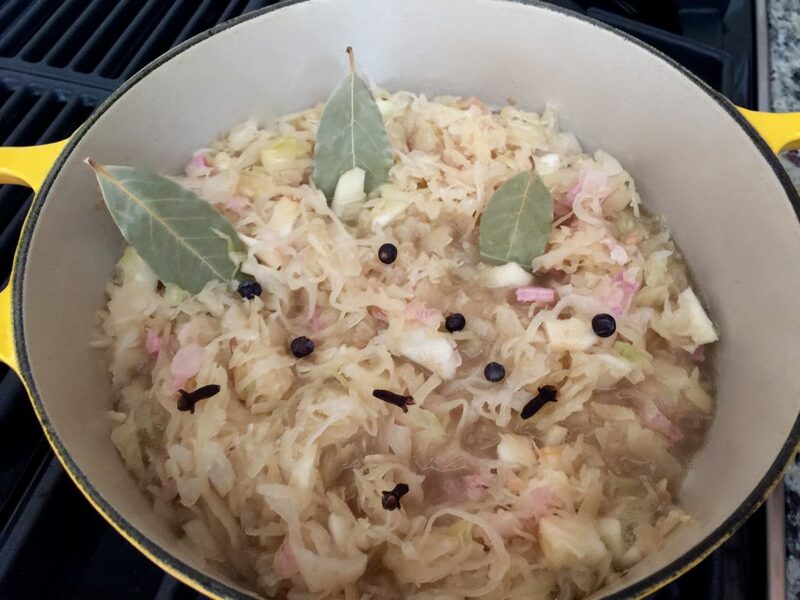 As the German Sauerkraut is already made with wine, you do not need to add wine. Apart from this, the preparation for the German Sauerkraut is the same as for the American Sauerkraut. Serve the Sauerkraut with the German Grilled Bratwurst, franks, or winers. To try the German Pork Roast recipe click here, the Grilled Chicken Drumsticks click here, or the German Meat Patties-Frikadellen click here.